Bursitis is inflammation of a small fluid-filled sac that sits near one of your bones. These sacs are called bursae (plural) or bursa (singular), and they help to protect the tissues that slide over the bone when you move. 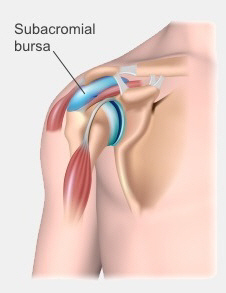 The illustration shows the bursa in your shoulder. Inflammation here is called subacromial impingement, or subacromial bursitis. You have more than 150 bursae in your body. The ones that most often develop bursitis are in your shoulder, elbow, hip, and knee. are overweight, which puts more strain on your joints.